Custom fields can be reported on and exported using a custom CSV export format in the finance area. 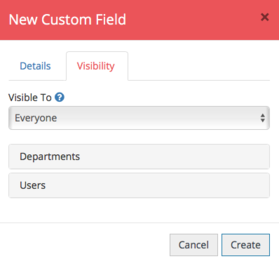 From Admin, click Custom Fields. 2. Click the New Custom Field dropdown. 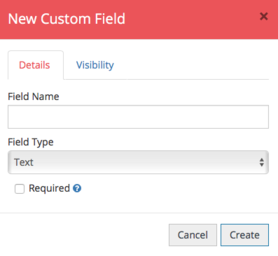 Here you can decide which area you would like your custom field to apply to. 3. On the Details tab, give the custom field a name. 4. Choose the Field Type from the dropdown. This dictates what type of data can be entered in that field. 5. If you would like this to be a compulsory field tick the Required box. 6. Navigate to the Visibility tab. This is where you can decide which of your users, departments or user groups are able to access this custom field on their expense form. 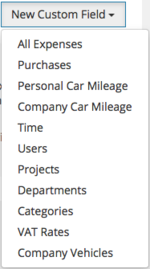 Visibility settings only apply to expense based fields such as purchase, time and mileage. Once you're happy, click Create to add that custom field to your account. Your new field will now appear in the relevant section.